Winds (in orange) and expanding blue ring carry nuclei of the heaviest elements into the galaxy. You would not bake a cake by popping it into the freezer. A freezer creates the wrong environment for baking. The atoms we’re made of did not always exist — our atoms had to be cooked up — assembled — from small, sub-atomic particles. Different atoms require different environments for their assembly. A simple model of an atom would have just two parts: In the center, a nucleus, which we’ll represent with the head of a pin. Surrounding the pinhead/nucleus, a cloud of electrons buzzes around. With a nucleus the size of a pinhead, the electron cloud covers a football field. Suppose our model weighs a thousand pounds — 999 of those pounds would be in the pinhead/nucleus. Nearly all the mass — the matter — of the atom is in the nucleus. Pick something up and you feel the mass of all those nuclei. The nucleus dictates what sort of atom you’ve got … the electrons sort themselves out in response. It’s the nuclei that require specific environments for their assembly — different nuclei, different environments. We’ve figured out where the environment is right to create most nuclei, but the birthplace of the heaviest nuclei has long remained a mystery. Hydrogen is a useful atom: Two out of every three atoms in water are hydrogens, and two thirds of our body weight is water. Calculating conditions in the early universe, hydrogen was likely cooked up early, just after the Big Bang. Carbon atoms form the backbone of most of the molecules in our bodies; oxygen combines with food to give us energy; nitrogen is essential to make muscle. These medium-weight nuclei are cooked up in the millions-of-degree environments in the hearts of stars. But there’s a limit to how hot a star can get, to how big a nucleus a star can make. Wrapping around your wind pipe, your thyroid gland requires atoms of iodine to make its hormones. But even the largest stars are not hot enough … until, at the end of their lives, they explode. Iodine and other heavy nuclei are assembled in the billion-degree environments of supernova explosions. “Heavy metal” was a chemistry term before it was borrowed by musicians. It doesn’t have a precise definition, but there’s no doubt that lead is a heavy metal. Gold is even heavier — denser — than lead. Osmium and iridium are denser yet, denser than gold, twice as dense as lead. To cook up the heaviest of all nuclei, we need not just “billions of degrees,” as Enrico Ramirez-Ruiz (UC Santa Cruz) wrote me by email, but also “nuclear densities.” A kid’s marble, as dense as a nucleus, would weigh a billion tons. Half-a-century ago, Jocelyn Bell was studying radio waves from space. Space-radio generally sounds, to the ear, like noise. But Bell was hearing — or rather, seeing, in her data — clicks — one after another, precisely spaced. Bell had found what we now call pulsars — a special type of neutron star, a star made almost entirely of sub-atomic particles — a humongous atomic nucleus, if you will, but not a tiny fraction of an inch across; rather, a dozen or so miles across. Neutron stars form when giant stars explode, and crush their innards to the density of atomic nuclei. Few stars shine by themselves — most have partners, two or three stars going around each other. 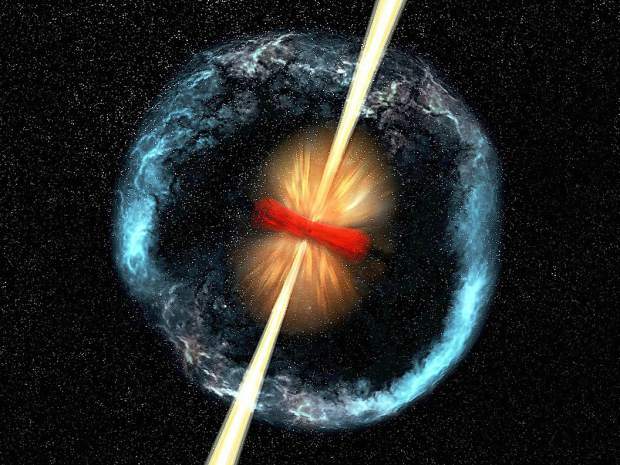 Suppose both stars in a double system explode, squeezing their cores into neutron stars. Suppose the neutron stars began spiraling toward each other. They smash into each other. Astronomers last month announced discovery of the collision of two neutron stars. They first saw the collision in gravity waves. A few seconds later, they picked up electromagnetic radiation (“light”), the glow of the heaviest of nuclei, cooked up in the collision.